Two teenagers have been arrested by police investigating a number of racist attacks on Romanians in south Belfast. 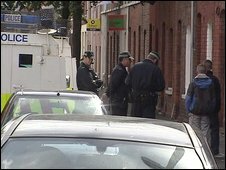 Two houses in the Donegall Avenue area were also searched during the operation. More than 100 Romanian people had to leave their homes on Tuesday and were housed in temporary accommodation. A Romanian family was attacked in east Belfast on Wednesday when a window was smashed in their home on the Upper Newtownards Road. The Romanian ambassador to the UK, Dr Ion Jinga, has discussed the attacks with PSNI Chief Constable Sir Hugh Orde and Belfast's Lord Mayor Naomi Long. In a statement, police described the meeting as positive with Sir Hugh outlining what the PSNI and partner agencies have been doing to ensure that the Romanian families "are safe, protected and cared for". "Also discussed at the meeting were the actions taken to prevent these attacks happening again and the ambassador was assured that the PSNI does not tolerate this type of crime anywhere in Northern Ireland and will pursue those who carry out such attacks with vigour," the statement said. Dr Jinga met Northern Ireland First Minister Peter Robinson and Deputy First Minister Martin McGuinness on Thursday. He said he was shocked by the attacks over the last week. "I have been encouraged by the reaction of public opinion here because every reaction I have seen in the media at least was in objection to what happened two days ago," he said. "I come to my first visit to Belfast in an unfortunate and unhappy context. It is a place where we could build up projects on economic grounds, cultural exchanges, social co-operation - there are so many things that can be done together." A rally protesting against the racist attacks is due to take place at Belfast City Hall at 1400 BST on Saturday. Barbara Muldoon of the Anti Racism Network said: "We believe we need a co-ordinated response to these attacks and we need to find space for people to express both their sympathy with the families and their anger against they racists. "We are hoping that this rally will be the first of many called to protest these attacks, and we are urging people to take the time to come down to the rally on Saturday." Meanwhile, a man who helped organise an anti-racism rally against recent attacks in south Belfast said he had been threatened. Paddy Meehan organised the protest after the homes were attacked. Mr Meehan said police told him about the threat to firebomb his home on Thursday.